I've stayed at this hotel multiple times a year for last several years. I'm here again now and this has been the most trying experience of them all. The cheap rates this summer have really packed the place -- and it is stressing service like I've never seen it. Three different staff members, who recognize me due to my frequency, have commented along the lines of, "Those $139 rates are making the place crazy." First, the one positive thing I have to say: In my view, the new Regency Club is an exceptional upgrade. I don't do the evening cocktail hour, but in the mornings, for breakfast, there is much more space and a first-rate continental offering. It's much more like an international Hyatt club. I've not had a hard time finding a table in the morning, even though the property is packed to the rafters. The lounge has been busy at times, but not packed. I actually use this place now -- I never used to. The downstairs Diamond/Platinum check-in has not been operating all week. I was told it's because the computer there was broken. Hard to imagine how hard it is to get a new computer, but maybe it's on a slow boat from the mainland. Talk about the wrong time for this desk to be out of service. So, I went to the lobby to check-in. The line was the longest check-in line I've ever experienced. I counted at least 40 people in front of me. There was a Japanese tour group checking in at the Diamond/Platinum counter, so that wasn't an option. I could not believe the wait. It was incredibly frustrating. It was just a taste of what was to come. The elevators are simply not designed to accommodate a full house. They take a long time, every time. Valet parking has taken 20+ minutes, routinely. Took nearly 40 minutes once, and 30 another. The phone line to valet frequently (I've encountered it 3 times) has a voice message stating, essentially, "We are no longer accepting phone requests for cars, please come down and we will retrieve your car for you." The driveway is mayhem most of the time. Twice, even though I called down in advance and reached a person, nothing happened and I've had to start the process over again. I had to have keys re-made (because they were coded wrong) three times. First the RC didn't work, so I got a new one. Then it would open the RC, but would not open the room. Third trip was the charm. Each time waiting in line behind no fewer than a dozen people. I later figured out that they could re-make keys in the RC lounge -- note to self. Service for lunch at Shor was slow and confused -- in spite of the place being empty. The most humorous of a few examples: A glass of wine appeared in a single-serving carafe, but with no glass for drinking it. The server could not understand that a glass was required for actually drinking the wine, so our waitress finally helped sort the confusion and get us a glass. She explained that with all the restaurants changing over a few month period, the staff is all being reassigned, based upon their tenure. That, combined with new formats and menus everywhere has created a significant state of confusion. Following a workout yesterday, I sent my gym clothes out to be washed. What came back was someone else's clothes in the bag with my room number on it. They sorted it and mine appeared some time later. I used a Diamond upgrade. I was excited to learn when I checked in that I was given a suite in the Diamond Head tower. But it's on the 33rd floor, so not RC, and it's a handicapped room. I've had these before and I don't like the bathroom, especially because there is a tiny closet with very little space to hang 8 days worth of clothes. I requested a different one, even if in the Ewa Tower, but there was nothing available -- because they're sold out. The cheap rates this summer have brought in a different clientele -- folks who I suspect typically stay a few blocks off the beach. It's a very different experience. I will be happy when all this is over. I can only imagine how happy the staff will be. Wow AZ, just reading your experience, I feel bad for the staff and what they must be going through. I was there a few months ago and I have to say that everyone I dealt with from check-in to the RC Lounge was extremely pleasant and helpful. That $139 rate certainly would bring in a lot of people who would normally be priced out of this hotel. A savings of $60+/night over 5+ nights will do that. I hope the madness ends soon and that you can find some way to enjoy what's left of your stay. I can tell you that more than likely there is nothing wrong with the PLT check in desk, they are simply trying to save money, that desk has been closed for two years now ( stay here a lot and have a corporate rate plan). what your seeing is the transformation of that hotel into "mass market". It's all about bottom line. Once the previous Japanese owner sold it began. New manager New mantle There are other interesting options opening up in Oahu. The HHV is remodeling the Rainbow and it is quite nice. Enjoy! Maybe you will be lucky and get one of the 40th floor suites like we got last year over Labor Day. 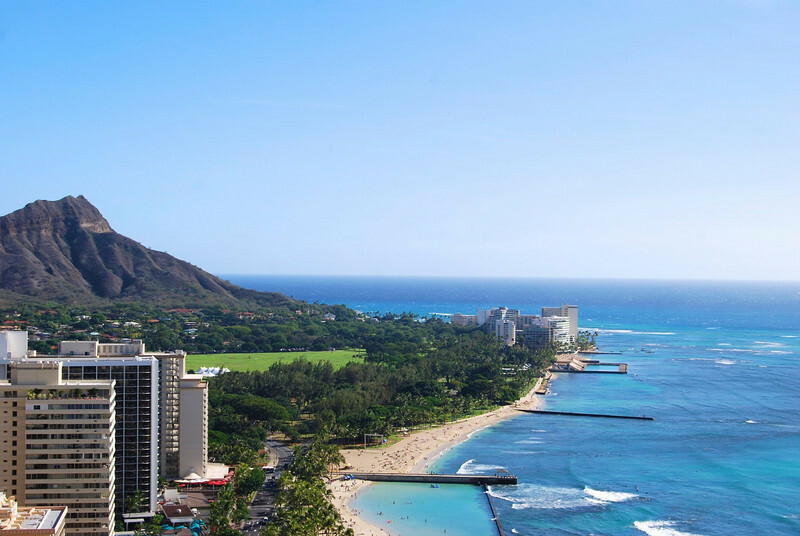 Those suites are amazing, and provide a great view of Diamond Head and the Ocean. I've got a two-night stay at Waikiki in four weeks, so I'm hoping that things will have calmed down. I know many of the staff at the Regency, and can only imagine how bad things have been. Keeping my fingers crossed. We are booked in October at $289 a night. I hope the clientele has changed by then. Nothing worse than worrying about your safety when in what you think is a beautiful safe hotel. Hope the rooms are sanitized to the max too. I heard that on Oct 13th there will be a huge celebration at the Hyatt for the completion of the big rennovation. Lots of luminaries from Honolulu will be in attendence. I will be there and hopefully will be invited to the event!! It seems to me that this property needs to be able to function at capacity or close to capacity, no matter what rates they are charging. The hotel is in a popular spot and they didn't build it to keep it half empty all the time. I'm by no means one who stays here often but it was open in Dec (checked in and out there) but not in May (checked in and out at the main desk). I think that the comment was made in the context of a Hyatt versus a Holiday Inn or Motel 6. Hyatt has always touted itself as a "higher class" hotel chain i.e. not for the "budget" minded travelers. And frankly I agree with them. As an older traveler with kids gone we prefer the upper tier hotels, a bit quieter, much more decorum within the hotel. At least for now the Hyatt has become what many of us hated most about the Sheraton Waikiki. We will be on property soon right in the middle of the Labor Day holiday. After AZs comments above I am not looking forward to it. We will be with friends so can not change. My friend is pretty you know what as the pool is not yet completed renovations. Probably going to get alot of you know what comments from him. Pray. What's described in the previous review sounds like a front-desk problem rather than the problems due to clientele. One has to have a nerve to jump a line in case when the key is programmed wrong. There is no way I would be standing in line to have the key fixed. Assuming we're talking about the Diamond/Platinum desk downstairs, it has been consistently operating when I've been there over the past two years. It just has relatively narrow operating hours -- around prime check-in time. It was re-opened yesterday. I was able to settle my bill with the agent there, who I've met on several prior stays. She said it had been down due to the computer problem for a week or so. Regarding the new Regency Club and crowds there, I just completed an eight night stay. While there were times when it was certainly busy during breakfast, I never had a problem finding a table inside. The food was consistent, exceptional and everything was readily available -- every day. I never made it to the club in the evening, so I can't speak to that. We are on property very soon. Anyone done the breakfast buffet since the renovation? Thoughts? Thanks. woot, I made it in!! The agent at the front desk (am I allowed to post her name? probably not) ... she's so helpful, courteous, and professional!! Was it Betty? She is awesome. Do you mean the one at SHORE? It looks amazing when I walk past it on the way to the lounge and the lady said I should try it one day. There was also a 15-20m queue at 9am though, they seem to be doing really bad with capacity in mornings. At any other time the restaurant is pretty much deserted. However, there seems to be space to enlarge both the restaurant terrace and the regency club's terrace so perhaps that's on the books for sometime soon. By the way, the elite check-in desk is as conveniently placed as possible, right at the entrance of the hotel and is open during the day, until 6pm I think. With regards to trips, I really feel I should recommend the Pearl Harbor, USS Arizona Circle Island tour from the expedia desk, number 4 on their leaflet for $65. It is definitely the best guided tour I ever took and the driver Nappy is a walking encyclopaedia of Hawaii. He'll also tell you some good jokes . Every second he was driving he shared with us his knowledge from the name of every flower we went past to why the police here own their own cars as well as various other 'local' stories . It's definitely a must for every visitor... you'll pretty much learn about the whole island of Oahu!